The question: Does it promote responsibility or just treat college students like kids? The University of Notre Dame du Lac is a private Catholic university which was established in 1842 and remained an all-male school until 1972. Its library system is one of the 100 largest in the United States. If students at Notre Dame are interested in applying for a credit card, they have to do it on their own and not through a credit card vendor on campus. 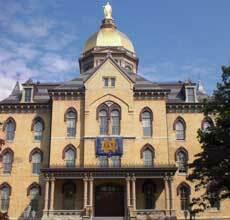 Credit card companies are not allowed to recruit new customers at Notre Dame, university spokesman Dennis Brown said. Brown said credit card vendors are subject to the university's general policy concerning noncampus organizations, which prohibits noncampus organizations from soliciting customers on campus. At football games, though, there are a couple of credit card booths that are not targeted toward students, Brown says. The booths sell affinity cards, which are credit cards that are co-sponsored by a bank and an organization -- in this case, Notre Dame. The Notre Dame affinity cards, Brown said, are meant to be purchased by alumni, and the university receives a portion of the revenue from the card sales. "Those are primarily directed toward alumni," Brown said. "Students could apply if they wanted to, but that is not the purpose or intent." The university also has its own credit union, the Notre Dame Federal Credit Union, located in the lower level of the LaFortune Student Center. "As soon as they turn 21, what's going to change? Are they instantly going to know how to spend money? There are a lot of people out there that are under 21 that are a lot smarter and know what to do with their money a lot better than even people in their late 30s." 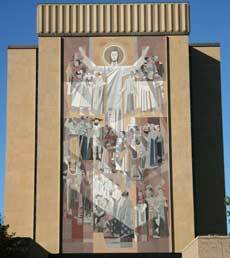 The University of Notre Dame's administrative offices are in the Main Building, which is famous for its gold dome. "Just knowing how many problems have been caused by people spending money irresponsibly, I'm more willing to accept more regulation from the government about things like that."